Online gambling laws in Australia are simple from the player's point of view. Simply put, there are no laws regarding your ability to place bets online. There's nothing in the criminal code that addresses the mere act of gambling, playing poker, or betting on sports. Operators (those who run gambling sites) exist in a more complex legal environment. 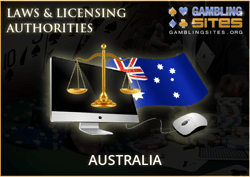 Australia passed the Interactive Gambling Act (IGA) in 2001, and that piece of legislation included a long list of requirements for operators based in the country. It can all be quite confusing as there are a lot of rules and exceptions to those rules in certain situations. The IGA made it illegal for local and offshore online operators to offer most forms of gambling to Australians. The biggest exception was sports and racing betting, which is allowed as long as all bets are closed before the start of any match or race. There are a number of big-name operators based out of Australia that specialize in online sports betting for Aussies. However, sites based in Australia may offer other gambling games to non-Australians across the rest of the world. However (again), there's a list of designated countries that cannot be marketed to if those countries have similar legislation in place blocking Australians from using their services. Australian citizens have no responsibility to adhere to the rules and provisions set forth by the IGA. It's the sole responsibility of the operators to ensure they block Australians from accessing any forms of gambling other than sports betting. What this all means is if you're an Australian punter who doesn't own a gambling site, you don't need to bog yourself down with all the legalities of trying to figure out which sites are legal and which are not. Just pick a site that's safe and everything else will handle itself. Unless the contrary intention appears, this Act extends to acts, omissions, matters, and things outside Australia. It's clear that the act prohibits offshore gambling sites from taking customers in Australia, but the legislation has no teeth. Dozens of sites openly accept Australians to this day without consequence. Although certain politicians occasionally make noise about cracking down on internet gambling in Australia, it appears there's little mainstream interest in actually taking action. You could contrast the situation in Australia with that in the United States by looking at the Unlawful Internet Gambling Enforcement Act (UIGEA) passed in the US in 2006. Like Australia, the US had longstanding laws against online gambling, but little means for enforcing them until the UIGEA was passed. In the United States, the UIGEA targeted the banking industry and made it illegal for financial institutions to knowingly process transactions to or from internet gambling sites. This went a long ways in curbing online gambling in the US by making it difficult for players to fund their accounts and receive payments. Australia, on the other hand, has no such provisions, and it's significantly easier for Aussies to deposit to and withdraw from offshore operators. In-play betting is a form of sports betting in which you can place short-term bets during the course of an event. An example of in-play wagering would be watching a rugby game on live TV and placing a couple of short-term wagers after the game has already begun. The IGA prohibits online sportsbooks based in Australia from offering these types of bets, but you can still get your fix at any offshore sportsbook. Sites based elsewhere aren't beholden to the whims of the IGA and offer a whole range of options to Australian customers.